It is usually a bit of a cliché when a company claims to give something back to the community. It might be in our case as well. The truth is that the small cocoa community of Baures, Bolivia gives us so much. They introduced us to the jungle, to the piranhas, alligators, jaguars – and to the cocoa. Oialla depends on the local cocoa company Sumar and the hundreds of indigenous workers who toil in under the green canopy to harvest those precious Beniano beans. There is no doubt that Oialla would not be if it were not for the people of Baures. Therefore, we humbly try to return the favor in the best way we can. Oialla works closely together with Danida – an aid program founded and run by the Ministry of Foreign Affairs in Denmark. Educating the workers in sustainable harvesting and fermentation. Buying new equipment – harvesting tools, rubber boots, motorized vehicles, thermometers and humidity gauges. Sharing information on the importance of rainforest sustainability through the radio in Baures. Offering education in forest management to our employees. Employing 34 women – with social security and paid absence on their children’s first sick day. Installing new roasting and conching machinery. Developing value added products such as cocoa vinegar. Constructing a small factory in Baures for roasting, packaging and developing value added products. The factory has an office for administration, sleeping facilities for visitors and bathrooms and changing facilities for both sexes. Danida is a part of Ministry of Foreign Affairs of Denmark. You can read more about Danida on their homepage. In order to receive funding and support from the Danish Ministry of Foreign Affairs Oialla must meet certain requirements. We define our common goals with Sumar – e.g. improving working conditions, offering more education and creating new jobs. Most of the funding naturally ends up in Bolivia for projects in Baures. Oialla receives help with marketing and sales, which are vital prerequisites for growing the business. There are big cultural differences between Denmark and Bolivia and in order to bridge the gaps and create a better understanding, we visit each other every year. We discuss various issues and agree on goals and plans for the future. Oialla’s aim is to create a better product and a stronger bond between us. 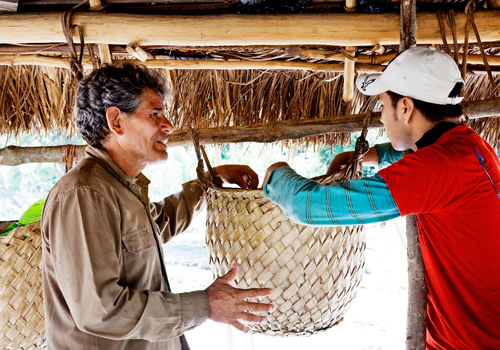 We learn how to operate in the jungle and how to manage and educate the local workforce. In turn we share our knowledge of European customer requirements and expectations. A visit to a Danish supermarket is a vastly different experience than its Bolivian counterpart. The Danish efficiency and ability to deliver orders on time is very different from the Bolivian culture where “mañana” still rules.